One of the best parts of the holiday season are the many different lights hanging on trees and houses lighting up the night. People enjoy the festive feeling they get when the lights are lit. Along with all the snow, food, time spent with family and friends the lights are a big part of the holidays. However, it can be hard to find ways to be more mindful of the environment as a whole with holiday decorations. A great option to be more eco-friendly are solar Christmas lights. With a variety just as wide in color and size as the more traditional lights, you'll be able to find the ones that are perfect for you. Today we will review one of the most popular solar string lights on Amazon, Homaz Solar String Lights. Hopefully by the end of this review you will be able to decide if these are the kind of lights you'd like to use yourself. I have always loved Christmas lights and loved to drive around when I was little to see all the decorated houses during the holidays. I never really thought that there would be much difference between lights though. Because of this I was interested to learn about Homaz Solar String Lights. After looking into a few different kinds I was impressed by these solar powered lights. These lights are very versatile, working in winter conditions as well as summer. They go well to light up your backyard on a summer night and for festive decorations during Christmas time. It would definitely make it on the list of our best solar powered lights. Along with many other string lights Homaz Solar String lights are made with LED light bulbs. LED bulbs are environmentally friendly and much safer and more efficient than outdated incandescent bulbs. With everyday bulbs that you use in your home LED lights have been known to last anywhere between ten and twenty times as long. A strand of these small fairy lights would only end up using anywhere between 1 to 4 watts of energy. As far as energy efficiency goes you can see why people would choose LED lights as the more eco-friendly option. Since LED lights use much less energy than incandescent bulbs this makes them a little bit safer. Incandescent lights get hot after being lit for to long. This runs the risk of a fire or an eletrical malfunction that can be easily avoided by using LED. Homaz solar lights also use flexible copper wire for conduction and molding. Copper is an excellent conductor and is a common material used in other lighting. These lights also use it to make it easy to mold and wrap around whatever and wherever you'd like them to be. Similarities exist between many different solar powered string lights. Something that the Homaz Solar String Lights have in common with others is that they are waterproof. Nobody would want solar powered lights that can't withstand water. With the lights needing sunlight most of the time they will be in area where they have the potential to get wet. Whether this is from rain or sprinklers doesn't matter, these solar lights need to last. If these are lights that you would use during the holidays they will most likely have to endure snow or rain at some point. This makes the waterproof feature a must have. These lights do have a switch for on and off if you decide that there are nights that you would rather have them off. However, when they are switched on they automatically turn on and off during the day. This allows them to save the energy for when it becomes dark enough to see the lights. Their description says they can last up to eight working hours when it has been a sunny day. The auto switch makes it so you have to worry less, once they are placed they work on their own and you can enjoy your time more! This product is well liked on Amazon. It has the Amazon Choice badge which is given to high selling items that have been rated well by customers. Obviously people like this product enough to continue buying it. One thing that probably contributes to that is the price, it is a great price for 33 feet of lights. At $22.99 that's less than a 90 cents a foot! Along with coming at a great price these string lights give you options for showing them. Homaz solar string lights come with eight different lighting modes: combination, waves, sequential, slow fade, chasing/flashing, slow faded, twinkle flash, and steady on. It gives you options for your preference of what you would like your lights to do. Something to remember with this product is that there is a one year warranty. If a customer ever has issues with this product they should remember to take a look at the warranty and notify the company. Homaz, the company that makes these string lights, doesn't have a company website. Their mission and values aren't known because of this. It is a good thing however, to see that there are more eco-friendly options to choose from. Because of this trend many companies are taking a look at how they are impacting the environment producing good products. Solar energy is just about as clean as it gets when it comes to energy and it is nice to see it used more. There are quite a few great attribute with Homaz natural string lights. First, they are a great price for how many lights you get. Each foot costs less than ninety cents! Next, the lights also use LED bulbs which give off more light and last longer, along with being more eco-friendly as well. In addition to all this, the string lights also have multiple lighting patterns available. Lastly, Homaz solar string lights use solar energy to power the lights. Not only does this save you money but it helps save the environment little by little. There are a small amount of reviews on this product on Amazon making it a little bit more difficult to gauge the product. The biggest complaints found were that the lights did not last for very long once it got dark. These customers reported that the lights only lasted for about an hour. Another complaint was that these lights are deceptively small compared to how they look on Amazon's page. After having reviewed the lights I think that the positives outweigh the negative. Most people thought these lights were beautiful and they loved not having to plug them in. With so many lights for such a great price I think you definitely get a great deal as well. 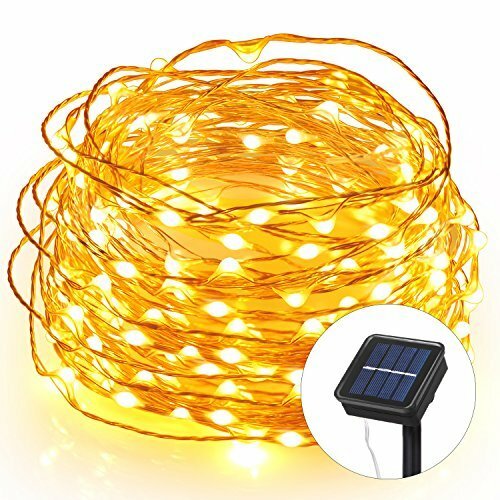 For the most part people seem to like these solar powered string lights. I would suggest them to a friend who was looking for something just a little different from the traditional hanging lights. In conclusion Homaz solar string lights are a solid product but also seem to have a couple design flaws. The lights are really pretty and efficient. With the Amazon Choice badge enough people seem to like and trust these lights. If you are interested in buying them yourself take a look at them on Amazon using the link below. Here are some top questions that I found for people seriously considering buying the Homaz Solar String Lights. How long do these lights need to charge? The lights take about 8 hours to charge. How many light options are there? These lights have 8 different lighting options: combination, waves, sequential, slow fade, chasing/flashing, slow faded, twinkle flash, and steady on.